::A&A:: Life is your creativity! : Poetic Frames Collection! New Release!! Poetic Frames Collection! New Release!! Poetic Frames Collection! New Release! !, a photo by ::A&A:: Life is your creativity! on Flickr. Have you ever looked for that perfect gift for that perfect special someone in your life? Come up empty handed? 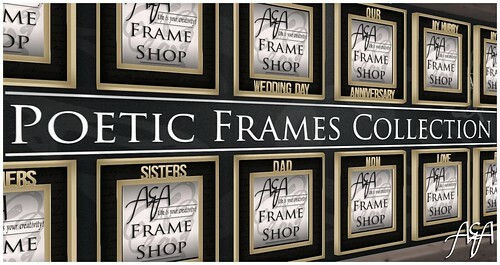 We now have frames that will suite any occasion from your Wedding Day to your Anniversary. For your Mom & Dad or Sister & Brother or that Special Friend. Come by and check them out! Reasonably priced at only L$125 a piece. — at http://maps.secondlife.com/secondlife/Warm%20Wishes/125/126/21.